Today’s been a Bank Holiday here in sunny rainy London, so it’s tradition to go and do something different. 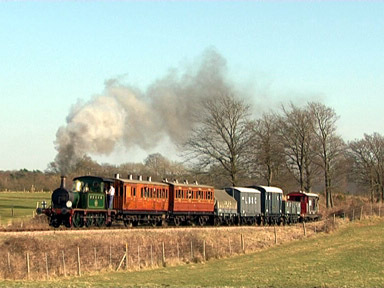 Like go and ride on a steam train. A steam train! And lots of fun it was, too. Gazing out the window as we choo-chooed through the pretty English countryside, a thought struck me. Trains are fun in a way that planes – for all the technological marvel that they are – never will be. Because, on a plane, one minute is just like the next. You’re very high up, you probably can’t see anything, you haven’t got any room, the bloke next to you looks a bit funny and it’s fundamentally dull in a way that whooshing through the air at 600 mph in a pressurised metal tube really shouldn’t be. But on a train, even a 130-year old one like the one we were on today, the scenery constantly changes. There’s a bridge! A deer! A farm! A cow! Another cow! SQUIRREL!1. It’s just fun, on a whole different level. You know, I still like getting the Tube every day (as long as I get a seat). And so here’s some Kraftwerk. One of their best tracks, capturing the mesmeric rhythms of train travel perfectly. Wonderful. 1 Yes, we watched Up last night.